River cruises are a way to show the kids multiple destinations in Europe, with one central home base, making it an easy way to introduce kids to foreign cities. One popular river cruise option is the Danube River, which travels along Eastern European and Bavarian regions. When cruising along the river, you’ll see some of the region’s largest cities, as well as historic and charming villages. For a glance at what to expect on the Danube, follow this traditional cruise port guide. While Prague is not located on the Danube River, it is often added on to the start or end of a Danube River cruise. The capital of the Czech Republic, Prague is often referred to as a fairytale city as it is filled with church spires, romantic architecture and an imposing castle. 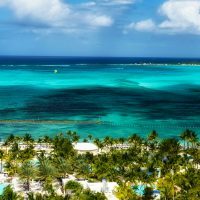 Adding this city to a cruise is highly recommended, although it comes with a longer transfer to get to or from the cruise. As the starting or end city on a Danube cruise, this small German village is quaint, but does not offer much in excursions for families. Known as the city of three rivers, Passau, Germany, is where the Danube, the Inn and the Ilz rivers meet, each a different color and providing an oil and vinegar appearance in the water converging. The charming Bavarian city is home to a beautiful baroque Saint Stephen cathedral featuring the world’s largest pipe organ. Thirty-minute concerts are held twice a day, costing just 4 Euro. The Veste Oberhaus castle, dating back to the 12th century, is accessible via a steep climb up stairs or cobbled street, affording the best views of the city and stretching across the river into Austria. A lovely restaurant is located next to the castle with the same riverfront views. In the village, shopping and marzipan treats are the highlight. 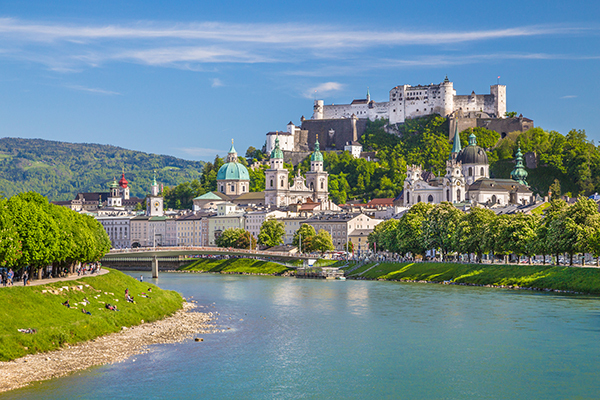 Most famous to Americans as the original home of the Von Trapp family and the setting to “The Sound of Music,” Salzburg is a city of manageable size for a day-long visit. Its old town is filled with shops, restaurants, churches and cobbled streets, as well as the golden yellow house that was the birthplace of composer Mozart. A fortress is accessible via funicular and provides another grand view, or cross the Salz River to visit the lovely Mirabell Gardens, where Julie Andrews sang and danced the famous “Do-Re-Me.” Outside the city is a salt mine that can be toured that includes rides on a mine train and shoots down wooden slides. Perhaps the most picturesque portion of the Danube is Austria’s Wachau Valley, where rolling hills filled with vineyards produce the country’s best dry white wines. The area is as popular with wine enthusiasts as Napa Valley is in the U.S. The valley villages like Spitz and Durnstein provide wine tastings, shopping and more charming, cobbled streets out of fairytales, with the later featuring the ruins of a castle that once imprisoned King Richard the Lionhearted of England for nearly two years. The site is now part of the UNESCO heritage sites. One stop not to visit is Melk, which is home to a palatial Benedictine Abbey. You may find yourself wishing for more than one day to visit Austria’s capital city of Vienna, which has so many fabulous places of interest you won’t be able to see them all within one day. Choose from the Habsburg Family palaces: the imposing winter Imperial palace in the heart of the city and home to the family’s jewels; the summer Schonbrunn palace just a few miles away and home to the Lippizzaner Horses and Spanish Riding School; or the Belvedere, which is now an art gallery hosting the likes of Gustav Klimt’s most renowned works, “The Kiss” and “The Woman in Gold.” Within the old city is the gothic St. Stephen’s cathedral, the opulent Vienna Opera House, and the Hotel Sacher, which created Vienna’s famous Sacher Torte chocolate cake. 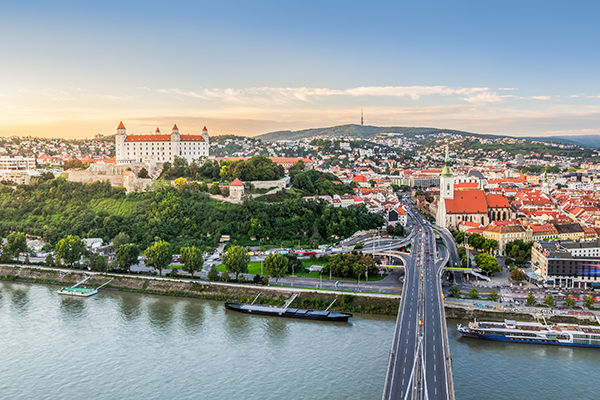 Add another country to the list when you make port in Bratislava, once the capital of Hungary during the Hapsburg Empire and now the capital of Slovakia. Throughout the town are a collection of whimsical statues, with men coming out of manholes or leaving on benches in the town square. Just outside of town is Devin Castle, which overlooks the Danube and Morava rivers that border Austria. The current capital of Hungary, Budapest is a combination of the former cities of Buda and Pest, where families can hopscotch across the Danube to visit both sides for a glimpse at both histories. The Buda Castle is hard to miss, as it rests on the hilltop of Buda, reigning over the Danube. The entire Castle Hill District is made up of houses and buildings from 12th century and is a part of the World Heritage fun to tour. On the Pest side, visit one of the city’s largest Hungarian bath houses, Szechenyi, located in the oversized City Park. The spa features thermal waters in which to soak and can get quite crowded, but is worthy of a dip.